Make every recipe perfect with accurate ingredient measurements. Add a touch of modern luxury to your kitchen with the Beurer Digital Round Kitchen Scale. The smooth, stylish glass design features an LCD display with legible digits and requires fuss-free cleaning. Using the tare weight function partnered with a 5kg capacity and a 1g graduation you can accurately measure your ingredients for the most precise results. The 19mm high scale can easily be packed away for later use and doesn’t require too much room on your kitchen bench. 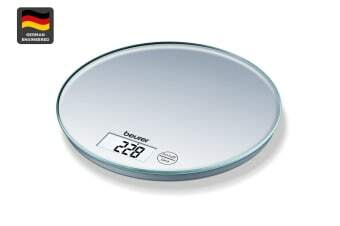 You also have a selection of different measurement modes including g, kg, lb and oz so you don’t have to worry about converting recipes.